Tonight we dined on Chicken Kelaguen. This was probably the most lengthily dish to make according to the recipe – 25 hours, not including the ‘few days’ needed to prepare the sauce. In reality it was really quick and easy. To start with I chopped an onion and a couple of chillis and mixed them with some soy and lemon juices, following the recipe from Genius Kitchen. After a few days in the fridge I threw the sauce over some chicken breasts and left them in the fridge over night. I was supposed to use bone in chicken pieces but it worked fine with breast. I then roasted the chicken and mixed with some grated coconut meat. 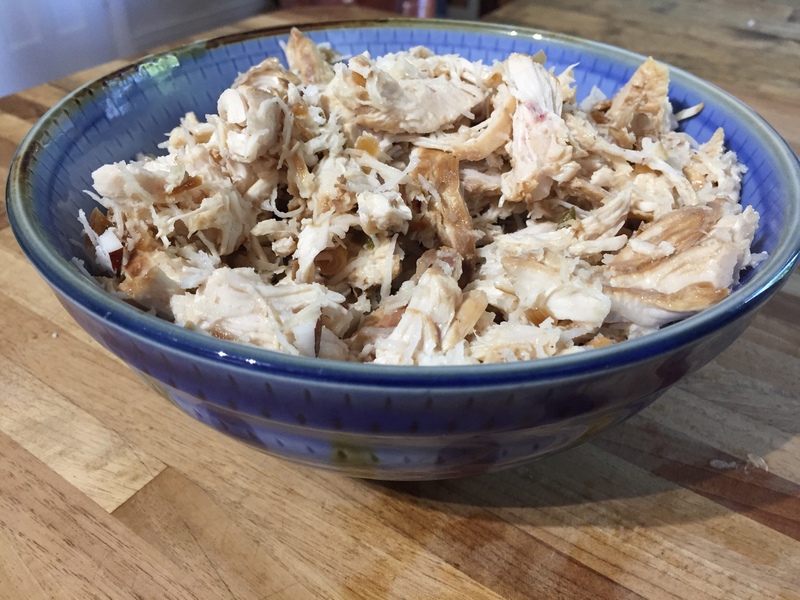 Once the chicken was roasted I shredded it and mixed it with coconut and more lemon juice. So so tasty and very easy to make!